(NAMES NOT IN WESTERN ORDER) Because Tsukuyomi is the kami of the moon and night time, his names reflect that. The kanji in his surname, 月, is the kanji for "moon," whilst the kanji in his given name, 夜, is the kanji for "night." Takama-ga-hara (高天原), the "heavenly plain" in Shinto lore. In Shinto mythology: Came into existence after the beginning, when she was born from the creator Izanagi's right eye. Yahiro seems like a cold, ill-tempered man who is far older than his physical appearance. At first glance, he seems like a buzz kill who doesn't like to have fun, perhaps maybe seeming a bit too serious. Though this is only because he doesn't take kindly to new people who haven't proved themselves trustworthy yet. After he has gotten to know someone, he feels free to joke around. If he gets really close to someone, he may seem happy like a child, despite his usual cold stature. It is very rare to see him like this though since he finds it really hard to trust people. If he feels threatened, he can get a bit violent, having been known to kill another kami before. Therefore he can also be intimidating too, especially if he deems someone as a threat. When it comes to people close to him, he can get a bit jealous and possessive sometimes. He treats people close to him with upmost priority, and can get a bit out of hand with it. He is a bit of a misogynist and believes that men have more privileges than women, but he is still a gentleman towards women. Despite being a "gentleman," he can be a bit of a pervert in his own mind. He hardly shares his thoughts and emotions aloud, but it's for the best. ☾ Though he seems cold and far from delicate, like his sister, he enjoys flowers. Fortunately for the flowers, he can take better care of them than his sister since he doesn't forget to take responsibility. ☾ His favourite colour is midnight blue. 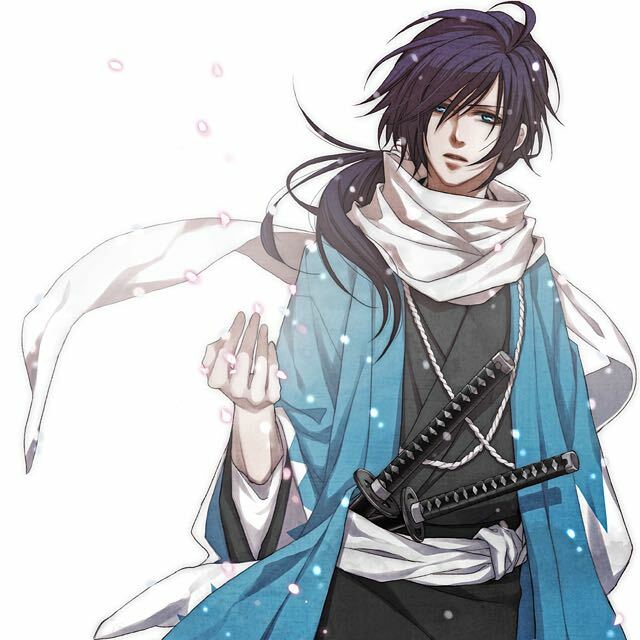 ☾ His favourite flower is the Japanese wisteria, which blooms at night. ☾ His favourite activities include archery and fishing. 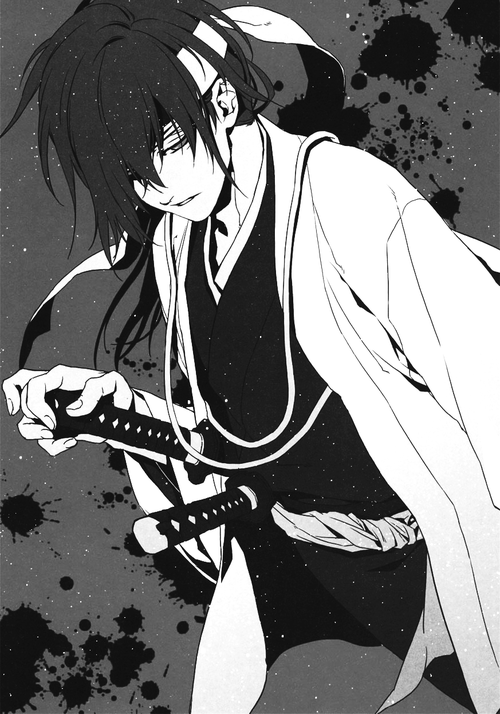 ☾ Though he seems to be a stone cold man with no fears, he can easily be disgusted, which can anger him. ☾ He hates sweet flavoured alcohol, so he loves bitter liquor like shōchū (焼酎), or awamori (泡盛), and typically drinks them on the rocks. ☾ Spring is his favourite season, though he does like colder months too because there is more night time. ☾ His favourite animal is a rabbit. ☾ He can play the piano and the violin. 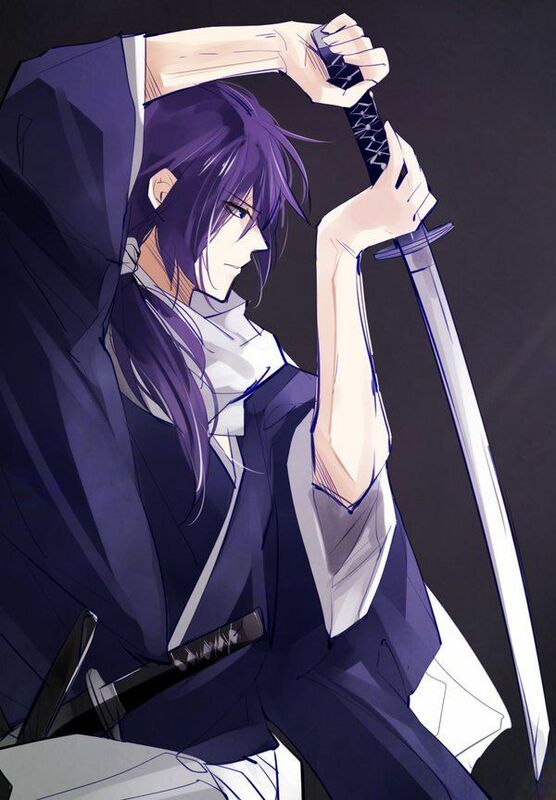 ☾ His favourite weapon to fight with is the tachi (太刀). ☾ He can speak two languages: Japanese (his native language) and English (he learned so he could speak with other nationalities, but he still has a Japanese accent). ☾ He has traveled across the world to many different places, and usually doesn't live somewhere for more than a month. ☾ He loves horror movies and dislikes romantic movies. ☾ He doesn't like anime with only a few exceptions. Yahiro is a tall man at 6'4", his large stature and toned body representing his godliness. He has tanned skin and double eyelids, almond shaped eyes with a dark blue hue to them. With long, silky purple hair, he ties it into a ponytail and usually swings it over his shoulder rather than keep it behind him. 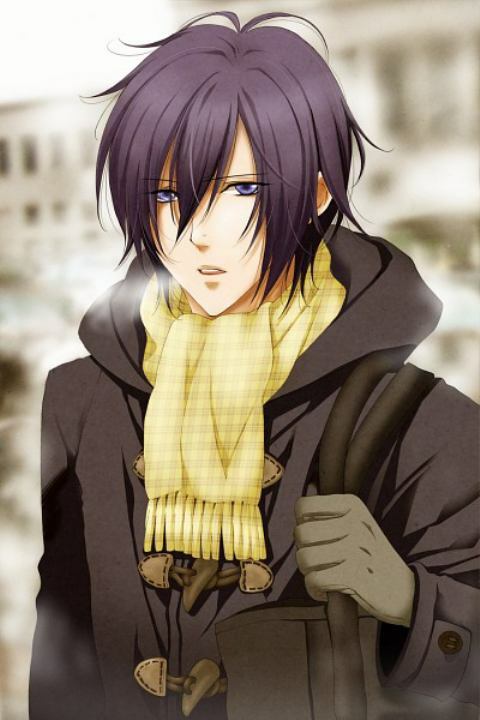 His gaze seems piercing and cold, his long purple eyelashes making his eyes pop. He has a long, thin nose and rather thick, rosy lips with a jawline sharp enough to cut diamonds. His bangs swing to one side and often cover one of his eyes. 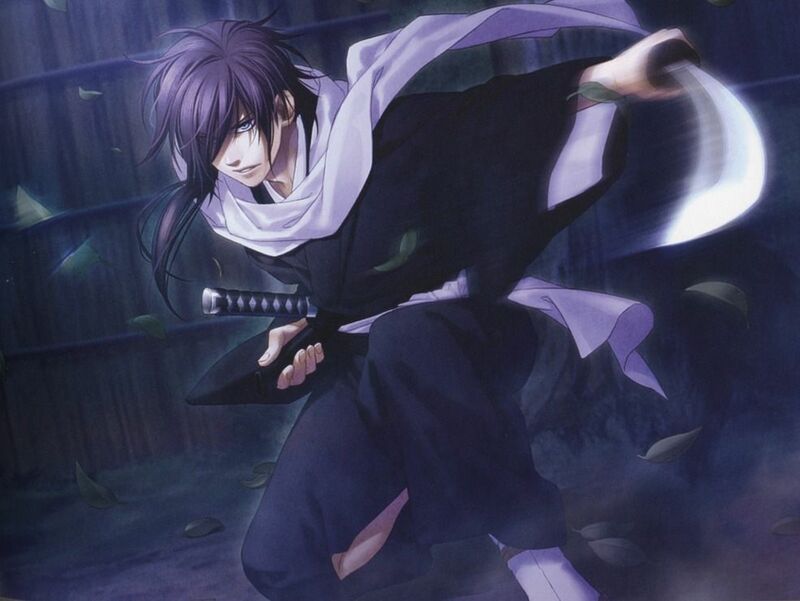 In non-traditional clothes, he often still carries two tachi, though his hair is short in human form. Takama-ga-hara (高天原 the Plain of High Heaven) is a place in Japanese mythology. In Shinto, Takama-ga-hara (or Takama no Hara) is the dwelling place of the kami. It is believed to be connected to the Earth by the bridge Ama-no uki-hashi (the "Floating Bridge of Heaven"). In Shinto, ame (heaven) is a lofty, sacred world, the home of the amatsukami. Some scholars have attempted to explain the myth of descent of the gods from the Takama-ga-hara as an allegory of the migration of peoples. However, it is likely to have referred from the beginning to a higher world in a religious sense. A Shinto myth explains that at the time of creation, light, pure elements branched off to become heaven (ame). Heavy, turbid elements branched off to become earth (tsuchi). Ame became the home of the amatsukami or gods of heaven, while tsuchi became the home of kunitsukami or gods of the land. The amatsukami are said to have descended from heaven to pacify and perfect this world. Tsukuyomi-no-mikoto (月読尊) or Tsukuyomi (月読), is the moon god in Shinto and Japanese mythology. 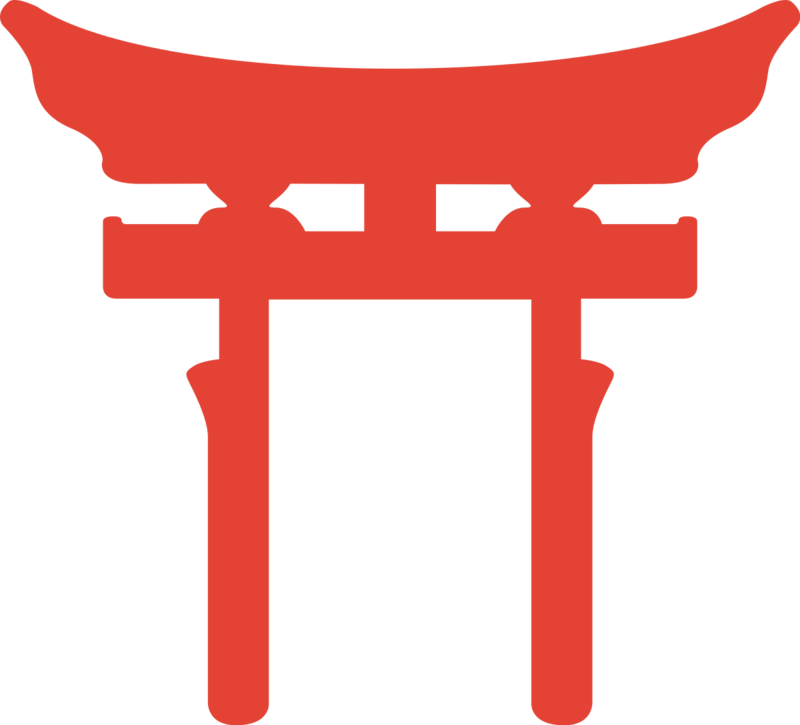 The -no-mikoto ending is a common honorific suffix for the names of gods, of similar meaning to "the grand, the great, the exalted". The name "Tsukuyomi" is a compound of the Old Japanese words tsuku (月, "moon, month", becoming modern Japanese tsuki) and yomi (読み, "reading, counting"). Unlike the myths of ancient Greece or Rome, the Japanese moon deity is male. This is clear in the earliest mentions in sources such as the Kojiki and the Man'yōshū, where Tsukuyomi's name is sometimes rendered as Tsukuyomi Otoko (月讀壮士, "moon reading man") or as Tsukihito Otoko (月人壮士, "moon person man"). Tsukuyomi was the second of the "three noble children" (三貴子 (みはしらのうずのみこ) Mihashira-no-uzunomiko) born when Izanagi-no-Mikoto, the god who created the first land of Onogoro-shima, was cleansing himself of his sins while bathing after escaping the underworld and the clutches of his enraged dead wife, Izanami-no-Mikoto. Tsukuyomi was born when he washed out of Izanagi's right eye. However, in an alternate story, Tsukuyomi was born from a mirror made of white copper in Izanagi's right hand. After climbing a celestial ladder, Tsukuyomi lived in the heavens, also known as Takamagahara, with his sister Amaterasu Ōmikami, the sun goddess, who also later became his wife. He is more powerful at night time, especially during a full or new moon, which is the best time to pray to him. Yahiro's colour on the chatbox is #9999CC.